Any confusion about Wisconsin law regarding credits for child support arrears might have (finally) been put to rest, thanks to a recent supreme court decision. 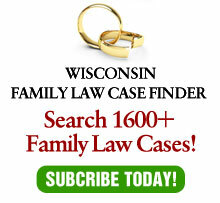 In In re the Paternity of John R. B., 2005 WI 6, the high court affirmed an unpublished decision of the District II Court of Appeals, holding that an alleged post-judgment oral agreement between the parties to modify child support is not a defense to arrears and that retroactive application of Wis. Stat. § 767.32 (1m) and (1r) does not violate due process. First, a little history. Prior to 1993, a trial court had discretion to forgive child support arrears. That year, the legislature created Wis. Stat. §767.32(1r), which prohibited credit for support due prior to the date of bringing a motion seeing relief. A subsequent court of appeals decision, Douglas County Child Support Enforcement Unit. v. Fisher, 200 Wis. 2d 807, 547 N.W.2d 801 (Ct. App. 1996), held that the courts cannot grant credit for child support payments not made in a manner prescribed by the judgment. In 1997, the legislature amended Wis. Stat. §767.32(1r) to allow credit under certain limited circumstances. In Monicken v. Monicken, 226 Wis. 2d 119, 593 N.W.2d 509 (Ct. App. 1999), the Court of Appeals held that the 1997 amendments applied retroactively. In the instant case, the father argues that retroactive application denies him due process of laws. In 1982, Barbara B. and Dorian H. entered into a paternity judgment concerning their young son, John. Under the terms of the judgment, Dorian was required to pay $30 per week in child support. In 2001, when John was 21, Barbara brought an enforcement action against Dorian for non-payment of child support. Dorian’s defense was that the parties had orally agreed that he could stop paying child in exchange for his stopping seeing the child. The trial court refused to apply the doctrine of equitable estoppel and concluded that retroactive application of Wis. Stat. § 767.32(1r) is constitutional. On appeal, Dorian argued that at the time of the judgment, the trial court had discretion to credit child support arrears. As a result, he argued that retroactive application of the subsequent statutes strictly limiting this discretion violates his right to due process under the state and federal constitutions. The supreme court, in a unanimous opinion authored by Justice Patience D. Roggensack, disagreed. The court applied the balancing test required by Martin v. Richards, 192 Wis. 2d 156, 531 N.W.2d 70 (1995), to determine whether retroactive application of these statutes comports with due process. The results of the balancing test performed by Justice Roggensack did not weigh in Dorian’s favor. As a result, the court held that retroactive applications of § 767.32(1m) and (1r) are rational and do not violate state or federal constitutional due process requirements. As frequently opined in this column, it is preferable in family court actions that trial courts have wide discretion since the range of possible occurrences can lead to inequitable results if courts are handcuffed. Similarly, by not allowing trial courts discretion to forgive arrears, certain inequities will result in cases where the payer could not bring a motion due to emotional, physical or financial restrictions. Still, it is the province of the legislature to enact laws, as inequitable as they may be in actual experience. It is the province of the courts to interpret the laws, as the supreme court has done here. The result, while it will undoubtably cause some inequities, at least is clear: If a person has a child support order, it can only reduced retroactive to the date of bringing an appropriate motion. An oral agreement is not sufficient. The law is clear, and payers ignore it at their own peril.